There's not much that can be said about Michigan's performance at Camp Randall on Saturday that isn't obvious from looking at the box score: John Clay trounced Michigan's defense, Scott Tolzien had a career day--like most quarterbacks playing against Michigan this year--and the Wisconsin rush defense is exceedingly stout. Early on, it looked like Michigan might be able to pull this one out, looking mostly unstoppable on offense and being able to go score for score with Wisconsin for a time. But, as has been the trend of late, the defense in the second half was absolutely shredded and Wisconsin was finally able to get a few stops. Doom and gloom and sadness. One of the only bright spots was Tate Forcier, who was impeccably good: 20/26 for 188 yards, 2 TDs, and an arm punt of an interception. But those numbers need to be tempered. Wisconsin's pass defense hasn't been great on the season, but more importantly, it was the kind of passes that Forcier was completing (and missing on) that told the story. Wisconsin was conceding the long ball for much of the game and trying to lock down the short passes that Michigan has been effective on. Wisconsin did an admirable job, and shut down the offense in the second half. Forcier threw three long balls, all of which were open. Matthews' catch down the sideline was the only good throw of the three, and even that was a little too far out of bounds. The other pass to Matthews was terribly overthrown and the interception that he threw was intended for Stonum, and would've been completed if he threw it to the outside shoulder. It was a good day for Forcier, but weaknesses were obvious. In terms of the running game? Well, that didn't happen. Brandon Minor--who is probably injured again--Vincent Smith, and Denard Robinson were the only ones that had any bit of success, and even that was moderate. Wisconsin completely dominated Michigan's run game and, frankly, it was a little disappointing that Michigan kept going to it when it was obviously not working. The most encouraging thing to come out of the game was Vincent Smith, who may have gone a way to solidifying himself as the premiere back next year. He ran tough and smart against a dominating defense that drastically outsized him. And his ability to catch and run out of the backfield was nothing short of a revelation. Expect to see him get a lot of playing time against Ohio State if Minor or Brown aren't 100%, and frankly, unless Michael Shaw can prove that he's worth all of the praise that's been heaped upon him--against teams better than Delaware State--Smith is going to be the #1 back next year. So what does this mean for the future? It means we're missing a bowl game again. 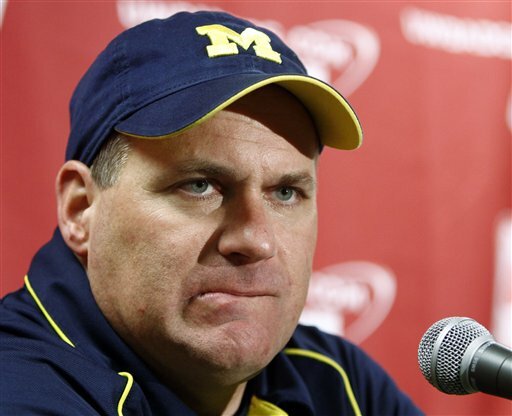 There was nothing here to inspire confidence that Michigan can beat Ohio State. Maybe it'll be one of these shocking turnarounds where the team puts together a good performance to save face. Maybe Pryor breaks his leg and their backup's arm (who was a minor league pitcher; I truly don't want to see him shred the Michigan secondary) explodes into dust. But if both of those things don't happen, Michigan's chances against Ohio State are somewhere between 0 and 3.6. Wooo arbitrary numbers! Basketball /= Football. But at least Manny Harris exists. It's a little tricky. Brandon Smith is clearly the guy that's going to take over for Stevie Brown's position next year. His move from safety to linebacker all but assured this earlier in the season. His move back to safety was a clear concession that Mike Williams wasn't working out. Michigan's done a couple of different things with coverage in the past few games, from moving Donovan Warren back into a safety role and having Williams play up near the line. For most of the game, though, Michigan was showing a cover-2 with Kovacs and Smith playing as the two deep safeties. This, inherently, splits the field in two and opens the middle of the field for seam routes (there's a great post on Smart Football that inadvertently shows this). The problem comes in that, a lot of times, we sneak Kovacs or Williams or Smith closer to the LOS to stop the run (it's a gamble). But what that's really gone to do is make our safeties into glorified linebackers. It's my estimation that they probably haven't spent a whole lot of time working on coverage because they've been coached into reacting to the run game (this is one reason why play fakes work so well against us). I plan on going into this tomorrow or the next day and will try and elaborate and make more sense of this.